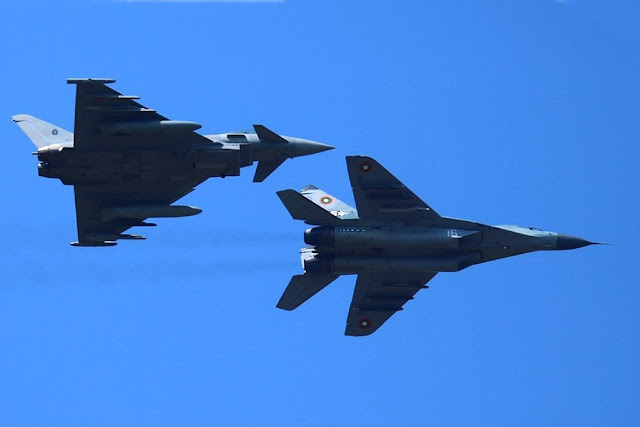 Italian Eurofighter and Bulgarian MiG-29 fly in formation. Rome, 8 October 2018 - On 1st October Italy and Leonardo submitted their offer to the Bulgarian Ministry of Defence in response to the recent Request for Proposal for the acquisition of eight fighter aircraft to replace their ageing Mig fleet. The Italian offer is based on the supply to the Bulgarian Air Force of Tranche 1 Eurofighter Typhoons from the Italian Air Force and includes also the option for the delivery of newly built aircraft as requested by Bulgaria. The proposal covers aircraft acquisition as well as training, three years in service support and weapons. Lucio Valerio Cioffi, Leonardo’s Aircraft Division Managing Director, said: “I believe that Eurofighter Typhoon can provide a cost effective and attractive solution for Bulgaria, delivering every capability and performing every mission the Bulgarian Air Force needs. The Eurofighter has already demonstrated its outstanding capabilities while performing Air Policing activities in 2017 from Graf Ignatievo Air Force Base. We are ready to support the Bulgarian Air Force with newly built aircraft or with the Tranche 1 Eurofighters of the Italian Air Force”. Eurofighter Typhoon is the biggest and most successful defence collaboration project ever undertaken in Europe. It is and will remain the backbone of NATO’s European air defence for the next decades and will be a central pillar of any European future combat air system. The selection of Eurofighter by the Bulgarian Ministry of Defence would also enable the Country and their whole Industry to benefit from the opportunities offered by joining such a proven programme. Eurofighter Typhoon is the most advanced swing-role combat aircraft available on the world market and can be deployed in the full spectrum of air operations including air policing, peace support and high intensity conflict. With 623 aircraft ordered, Eurofighter Typhoon is the largest military procurement programme in Europe. It is a technology driver for the European aerospace industry that offers huge opportunities for industrial participation. More than 100,000 jobs across 400 companies in Europe are secured by the programme.